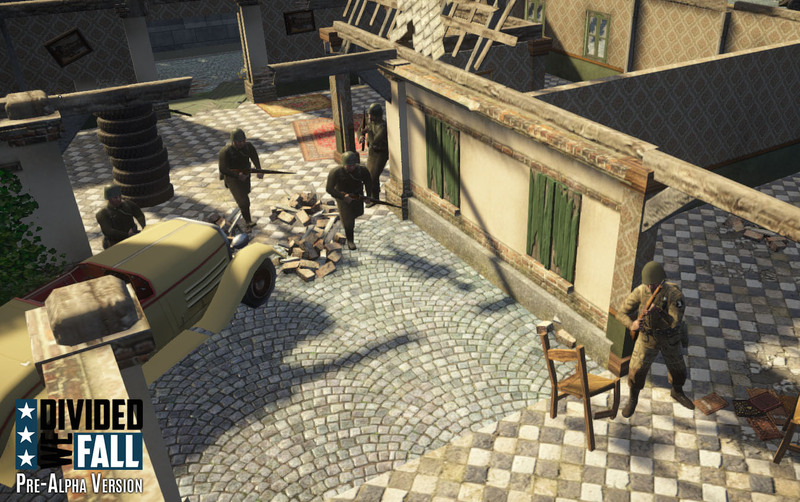 Divided We Fall is a close-combat multiplayer game with team-driven strategy at its core set in various immersive battlefields of the Second World War. Command your squad through WW2, form well thought-out battlefield tactics and execute them effectively to ensure your path to victory. Hone your skills in fast paced 1 vs 1 real-time battles, or join battles with up to 15 soldiers per side (bringing 120 soldiers in total), each will require a great amount of planning, co-operation and teamwork. Become a commander by being the highest ranked player of a team, devise an overall battle plan for your team and assign weapons to your soldiers through an in-game board interface. To achieve victory as a commander on the battlefield, you must make effective use of terrain to provide cover for your troops, create deadly kill zones and ambush the enemy. Success hinges on the tactics formed during the planning phase, the effective teamwork between each other and the individual execution of the chosen tactics during combat. ● Use the World War II terrain to your advantage; provide cover for your troops and create deadly kill zones and ambushes. Man are we excited! Thanks to our continued efforts, both from us and everyone who helped by playing and testing the game, we are leaving Early Access behind us and are releasing Divided We Fall today!!! For this special occasion we are kicking things off with both a Free Week and 25% discount. And.... in-game you can now spot the all new cooperative game mode, which allows you to play alone or with friends against AI bots! Of course we’re not putting our feet up but will continue to work on improving and expanding Divided We Fall. We have a ton of cool stuff planned, such as destructible and elevated terrain, melee combat, a morale system, and additions to the AI and map editor. But more on that later. For now, thanks to all who helped us in realizing our dream! We hope you enjoy the game (and our brand new release trailer)!